“And why do you worry about clothes? See how the flowers of the field grow. They do not labor or spin. Yet I tell you that not even Solomon in all his splendor was dressed like one of these. If that is how God clothes the grass of the field, which is here today and tomorrow is thrown into the fire, will he not much more clothe you—you of little faith? This rose isn’t waiting for dormancy, but is blooming still. When I pick a flower, whatever the season, I have contact with the Creator of heaven and earth. Does this bring the 2018 growing season a sense of closure or will I still dream of rosebuds in December? Today’s beautiful blossom is part of Cee’s Flower of the Day Blog Post. Isn’t that a beautiful flower, Kathy ? The picture with the light effects and the blue clouds makes for a great keepsake. Did you go to the ground level to take that picture ? Hi Susie, I actually picked the rosebuds, held them in my left hand up towards the beautiful sky, and took a photo of them. Oh I LOVE the lines of your haiku, and it’s a gorgeous photo too. Thanks…I wrote them in high school long, long ago…I like to try them now and then. 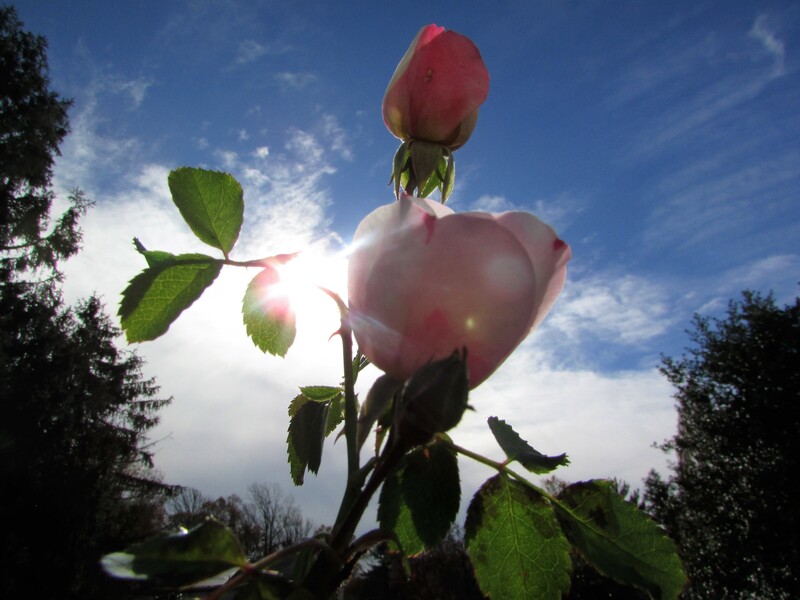 The rose against the Autumn sky seemed a perfect moment to capture in both photo and poem. Pingback: Tuesday Photo Challenge – Round Up 136 – Dutch goes the Photo! Beautiful share and way of being! God bless!